Posted by Barbara Prime at 3:11 p.m.
November 20, 2010 at 4:20 p.m.
Love your holiday freebie idea! Thanks so much. November 21, 2010 at 2:10 p.m.
Oh, I gotta, gotta, gotta get to the point where I make a pup sweater. You have to find this funny, that making a tiny sweater is such a delicious dream in my life = and I don't find myself in the least pitiful (on this count). November 21, 2010 at 8:22 p.m.
BTW, there are ways to "get" the chart from the blog. A screen shot is the easiest. If you are on Mac, you can use the Grab program. If this is acceptable to you B. If not, then simply delete this comment. Another thing that people can do is just save the blog page as an HTML doc. November 21, 2010 at 8:30 p.m.
November 22, 2010 at 11:04 a.m.
Wow! You are the fist person to use the Tricksy color chartmaker and embed it on their website. I'm Charles and I wrote the chartmaker program. Would you mind if I linked to you from my blog and showed your chart on the Tricksy Knitter site? November 24, 2010 at 3:56 p.m. I don't mind at all if you'd like to link to my blog! Glad I could help test the chartmaker (btw, I found it via the Knitty blog). November 24, 2010 at 3:59 p.m.
Hi Barbara. 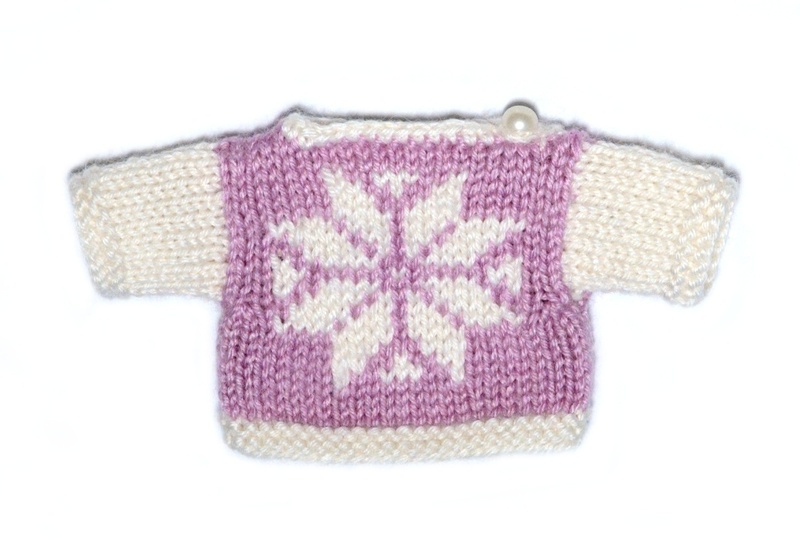 I've blogged about your snowflake pattern and linked back to your blog. I'm working now on a stitch chartmaker that will convert knitting shorthand (k4,p2,k2-tog,...) into charts. I'll let you know when it's ready if you're interested. November 25, 2010 at 2:07 p.m.
Oops, I said in my blog that the pullover was for a baby, not a teddy bear. I fixed it and linked to your store. Love the creatures. Pity my kids are too old. November 27, 2010 at 1:40 p.m.
To print out the color chart alone, click the link on the chart (Snowflake Chart at Tricksy Knitter) and you will be taken to the Tricksy Knitter site. Print the page you arrive at and only the title and the chart will print out. The rest is stripped out before being sent to the printer so you should end up with a nice clean piece of paper with the chart on it to work from. November 29, 2010 at 12:47 p.m.